Good morning and a warm welcome to you all. Thanks for joining me today and popping in to see my creation for a challenge over at Papertrey Ink. This week Papertrey is have a challenge, it is #316 Stenciled Edges by Lizzie Jones. As you can see I used the Make-it-Market: Garden Gate stencil around the border of my card which draws your eye to my focal point. The Stitched in Time Borders Stamp and Die set is So pretty, I decided to use foam tape to give it dimension. I embossed the sentiment and the border around it, giving it a raised shine. The butterfly has lot of glitter and in the sweetness of the card I put pearls, forget me knot flowers, sequins, tulle and twine for added interest. Oh, what a pretty card with all those soft colors! I didn't even think to use the Garden Gate stencil but it looks wonderful on your card. Is that tulle at the bottom? What a great idea! I know a perfect recipient for your sweet lavender card...my granddaughter (she loves anything purple)! Love all your extra touches. Very pretty! 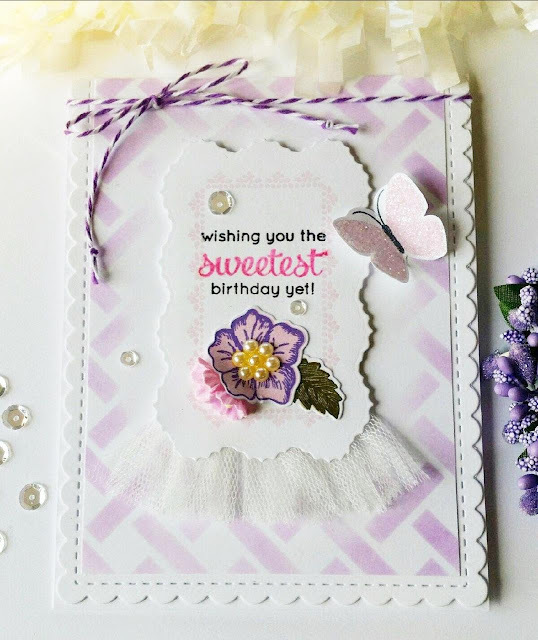 I love all the elements of your card.. from the stenciling to the sweet butterfly. Oooh I used that stencil too! It's so pretty in your lavender. Love the flower and bit of tulle! Pretty! What beautiful dainty touches! Love the pearls and tulle, especially! Such a stunning card. This is so delicate and beautiful Nancy! Your stenciled background looks fabulous with the scallped border die and the tulle and twine add great texture. Love it!! I just became your newest follower too! Nancy, this is such a sweet birthday card! The stenciled edges work just perfectly with this fun design! Happy Easter! Thanks for stopping by my blog, Nancy! What a great use of the stenciling technique & I love the tulle!